In last week’s blog post, I described a few localities in Ohio where someone could look for and possibly find some amazing fossils. Well, based on the feedback I received following that post, I decided to go ahead and share some of my favorite locales for West Virginia and Pennsylvania. The sites for fossil hunting in West Virginia are provided below, and I’ll be sharing the ones in Pennsylvania in the next blog post. As a reminder, please make sure you follow the cardinal rules of fossil hunting that I mentioned in the previous post. That way everyone gets to enjoy the thrill of discovering something! West Virginia is really one of the most unique and beautiful places to hunt for fossils. 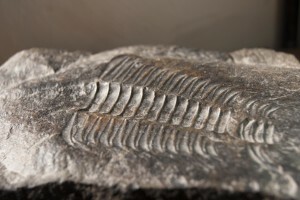 Unlike Ohio, which has a number of designated, government-approved areas to hunt fossils, the various quarries, road cuts and abandoned mines are usually the best places to discover great fossils. However, because of changes in land ownership, safety concerns and development over time, not every site stays accessible. So before you start picking through a particular site that I have listed below, be sure to keep your safety, and the possibility that you may be trespassing, in mind. That being said, here are a few of my favorite places to go fossil hunting in West Virginia. This locale contains outcrops of the Port Jervis Limestone, which is chock full of various fossils from the Devonian Era. Various rocks and fossils of interest can be found along the side of Dumpling Run, about 0.86 miles to the west of the edge of the town. There is also a nearby creek, also called Dumpling Run, that has some great stuff as well. If you’re looking for trilobites, crinoids, mollusks and coral from the Devonian Era, the road cuts along Old West Virginia Route 55 by the Lost River is one of the best places to start your search. While there are numerous examples of possible finds all along this route just west of Wardensville, one of my all-time favorites is located about 4.5 miles to the west along Old West Virginia Route 55 just east of Pinnacle Drive. Just be sure to watch for traffic, and be respectful of the people and wildlife. This locale, which is, incidentally, where I found my first brachiopod fossil, is a great place to look for great fossils from the Devonian Era in geological time. Just keep in mind that many of the fossils may be small, and they are still fragile, so don’t be surprised if you need to do a bit of repair work to get an entire specimen. Plus, it’s fairly easy to find — just travel to Yellow Springs on US Route 259/Carpers Pike until you come to West Virginia State Route 14, which should be just west of the Yellow Springs post office. Turn north, and travel up West Virginia State Route 14 for about 1.8 miles. The Cacapon River should be seen to your east, and the shorelines of that river are where you’ll find some great specimens. Finally, I really couldn’t leave West Virginia without mentioning one of the best places to have fun in the state. In addition to great hiking trails, whitewater rafting, bicycling and hunting, the New River Gorge National Park is a fantastic place to find fossils of all types from the Devonian Era. However, since this is a national park, you probably won’t be able to take the fossils home with you. It’s best to leave them where they are unless you have specific and direct permission from the park service to remove fossils or rocks from the park. However, with the number of fun activities that are already at your fingertips, I doubt you’ll mind very much. So what are some of your favorite places to hunt for fossils in West Virginia? Comment below!